We don't trifle with the art of creating EM in the Manikin studios. The Schrittmacher Sequencer and the Memotron are two innovations of the German label craftsmen which propel the music of Keller & Schönwälder towards other digital heavens. 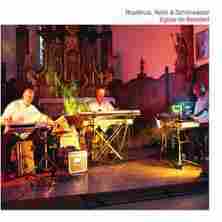 Recorded in Luxembourg, 2010, “Eglise de Betzdorf” made all the display of the crystalline tones and follows the oasian and poetic tangents from the Repelen series, in particular Repelen 3, with minimalist soft rhythms where a kind of progressive New Age calls to mind the hypnotic structures of the famous German duet and their faithful accomplice Bas Broekhuis. Synth pads of fogs tinted of morphic blue confront themselves in an introduction where the ringings of carillons and Arabian percussions draw the rhythmic dusts of "Silent Running Part I and II". The intro is of shamanic poetry with bells of wizards which ring in the slow violin tears of a melancholic synth. One guesses a muffled rhythm answering to the dusts of the winds which entail the prisms of the carillons towards the chords of a guitar forged in the solitude of the electronic machines. The sound effect is striking. One would really believe to hear an acoustic guitar played the airs of desperados on the ringings of the carillons and the rattle shakers percussions. And quietly the structure of "Silent Running Part I and II" is taking shape in the vapors of absent voices and the skipping of a soft movement of sequence which spreads a mesmerizing and delicious furtive rhythm. A delicate rhythm which borrows the same paths as Sunset Café (Repelen 3) but with a more romanced and moderate approach where the delicate arpeggios of synth take a more lyrical touch, becoming confused easily into the notes of an acoustic guitar and of its Arabian nomads' airs. Bas Broekhuis makes roll his sticks in soft drum rolls while the synths pour mist of silvery dusts, dipping the contemplative sweetness of "Silent Running Part I and II" into ambiences a bit cosmic. The influence of contemporary Schulze is remarkable on this long minimalist ode which boasts about its sound wealth as it progresses. The Arabian flutes caress the fine kicks of the percussions, while the rhythm becomes less dreamy and more electronic before evaporating in desert winds and astral voices. There where are dragging chords and percussions which deny the abandonment of a rhythm, there where are singing Persians and seraphic voices to put to sleep "Silent Running Part I and II". "Tea with an Unknown Girl" is as much delicious. The rhythm stands over finely stroboscopic lines of sequences which wind up and criss-cross in a pure movement of static delight where the percussions of Broekhuis support marvellously the dance of these rotary keys. The harmonious ambience is always so near to the oasian approaches that the trio seems to like since the musical adventures of Repelen. The oniric flutes and the angelic voices are the bed of ethereal atmospheres which cradle this passive rhythm whereas the chords of guitars, stolen from the contemplative synths, draw harmonies borrowed to nostalgia and sing of their emotional pinches into the astral mists of synths. Synths which caress our hearing with superb solos, delicate and creative but especially very electronic. It is a very beautiful track with a rhythm as much softly as the harmonies which quieten it. Even if we always have the vague impression of hearing a music that we have already heard, the music of Keller & Schönwälder always remains as attractive than its hypnotic structures. “Eglise de Betzdorf” dips us back in the Arabian moods and the magic of the 1001 nights that the trio kissed in Repelen 3. It's soft, oniric and it's a delicious mixture between the Teutonic minimalist electronics and the tranquillity of a progressive New Age. And I like this initiative that the Manikin label implants by realizing under the shapes of EP the performances of his craftsmen in concert or shorter albums which don't reach the 77 minutes mark. Remember the time when vinyl last 45 minutes? Shorter for the better! Those were the days which saw much of the classical EM produced to date... and this even if sometimes we have this vague impression of hearing a music that we have already heard.